Not long gone...and certainly not forgotten! I think I posted on Facebook that it was perfect -- which it was! It began, of course, in a candlelight service at St. Cyprian's, Lacombe, on Christmas Eve. After the service, there was birthday cake, and my son led those gathered in a joyful rendition of "Happy Birthday" for Baby Jesus. 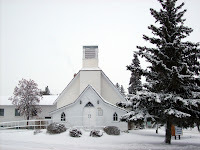 The next morning, we gathered up the Santa-filled stockings and all the presents from under my tree, load the car and headed north on the highway to Edmonton. We (just three) celebrated at my DD's new house-fast-becoming-a-home. She made her first Christmas roast chicken dinner. I coached her on the gravy, and on basting The Bird. He turned out...well...perfectly. Add spinach-pomegranate salad (with goat cheese), a dollop of mashed 'yam-tatoes', and home-made dinner rolls...et voila! Before we munched, though, we opened presents and called family who couldn't join us this year. 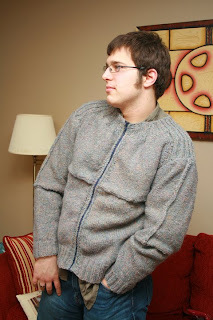 The good news for MomKnitter was that the sweaters suited their recipients -- and fit! I know the Yarn Harlot claims that her family has Christmas celebration down to a fine art, but I'd say that she's got some competition, eh? Wow! What perfect knitted gifts - fit, color, style, stunning! That fitted T is gorgeous - almost as pretty as the model. I agree! What lucky people! Glad you had a great day.